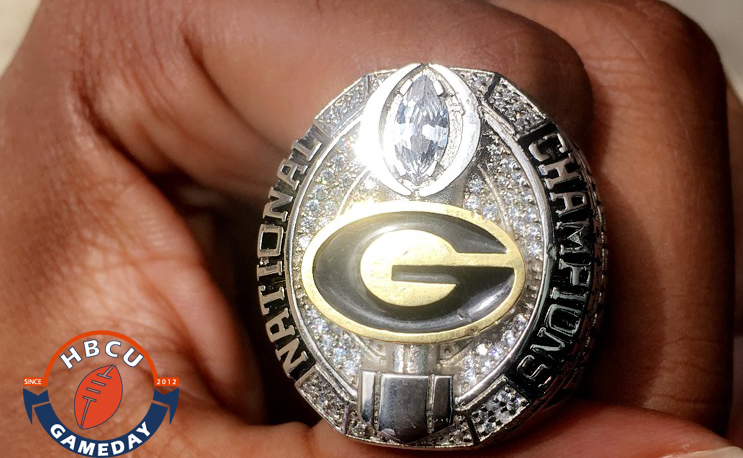 Grambling’s HBCU National Championship rings are in. To the victor goes the spoils, and there was no bigger victor in black college football during the 2016 season than Grambling State. The SWAC Champs and Celebration Bowl winners revealed their national championship rings on Wednesday. The rings feature the Celebration Bowl logo on the side with a 12-1 mark indicating GSU’s record for the 2016 season. Officially Grambling finished 11-1 because its season opener against Virginia University of Lynchburg was a game against a non-countable opponent. GSU beat VUL 72-12 though, and decided to add the game to its official total, which includes its 10-9 win over North Carolina Central in the Celebration Bowl. Grambling quarterback DeVante Kincade’s championship ring. The Tigers will look to defend their SWAC and HBCU national titles in 2017 as it returns key players such as Kincade and running back Martez Carter as well as transfers Anfernee Mullins (Mississippi State) and Kendall Hill (Oregon State). The ring is nice. Do you all know who pays for the rings? The SWAC? Celebration Bowl officials?